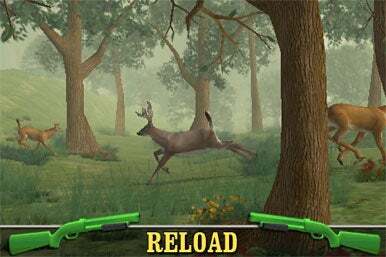 Big Buck Hunter Pro is the iPhone version of the arcade game classic that tasks the player/hunter with taking down bucks and scoring bonus points for shot efficiency. Beautiful graphics, realistic animal movements, and a variety of sites to hunt makes this an adaptation any hunter would be proud of. There are three wooded sites where the hunts take place. Two are green and one is covered in snow. Each scene begins with a couple animals grazing without suspicion. After a few seconds or the first shot, the animals bolt and the hunt is on. Both male and female animals begin crossing the screen and you just tap where you want to fire. Thrill of the Hunt: After the first shot in Big Buck Hunter Pro, the animals will scatter and race to escape you. The graphics and realistic depictions of the animals are outstanding. Three bucks are available to shoot in each scene and they can be challenging to hit. They’ll run back and forth between the trees, zig-zag and so forth. And often times they’ll be accompanied by a doe running alongside. It’s a nice touch that the game appears to require that you “lead” the targets by firing slightly in front. You can take down a buck with one well-placed shot in the vitals area, or two shots anywhere on the body. Once the scene is complete you’ll be taken to a scoring screen that recounts the animals you took down. The screen shows where the shots landed on the target and awards points for variables (number of points on the rack, size and distance, bonus critters, and so on.). If you unfortunately hit a doe, the scene closes with no additional scoring. You’ll get credit for any bucks taken down previously, but that’s it. In adddition to hunting deer, there are numerous “critters” (birds, squirrels, and coyotes), all of which are available to shoot as bonus points. Once you finish a site, you’ll have access to one of three bonus areas. There’s one with ducks taking off vertically, another with gophers popping up out of the dirt ("Freeze, gopher! "), and an almost comically simple one with frogs floating lazily across the screen on lily pads. If you don’t get 10 out of 10 on that last one, either check your sights or cut back on the gin. Shot accuracy was my biggest challenge, and I experimented with several hand positions. The reload button is on the bottom of the screen and must be tapped after each shot. I found that laying my iPhone flat and using just one hand to fire and reload gave me the best results. Using two hands, one to fire and another to reload‚ took up too much screen space. To me, the fewer moving parts, the better. Accuracy of shot placement is my biggest complaint with Super Happy Fun Fun’s iPhone effort. When you point a gun in the arcade game, you have a pretty good idea where the shot will land. But that issue is far from certain when it comes to chubby fingers flying furiously around on a small, mobile touchscreen. I found that even when I took extra care to position the perfect shot, even on stationary targets, the results were just as unreliable. Over time I found that my skills improved more on predicting movements rather than improving shot technique. The game developers seem very interested in tying this mobile game to the arcade version. There’s an in-app locator service that lets you find your nearest arcade unit via Google Maps. There are also networked and local scoreboard where you can compare your results against the big guns. If you're just starting out, I'd advise beginning with the easy bonus areas and then moving onto one of the more advanced hunts to test your skills. Shot accuracy almost always improves over time. So don’t get discouraged if you’re hitting the wrong targets (or nothing at all).